A dining table is the brand ambassador of your residence whenever you invite your guests over for a feast. Hence, it should showcase the refined and sophisticated personality that you sport. This is the right way to impress your friends and business associates with an element of panache reflected in your beloved abode. There are many kinds of dining tables based on styles and sizes. However, you must certainly choose a luxurious one that has exquisite aesthetic appeal. It is a common misperception that luxurious furnishings have to be exorbitantly expensive. However, this is not the case. While it certainly makes sense to invest a good amount of money when you buy a dining table, this does not mean that you spend a fortune on it. The important thing to note here is the ambiance of your house. Always try to fit in the dining table with the overall structure of your house. If the table does not match with the surroundings, then it will spoil the appeal of the entire space. You can even take the help of an interior designer if you are not able to decide which dining table suits the best for your dining room. 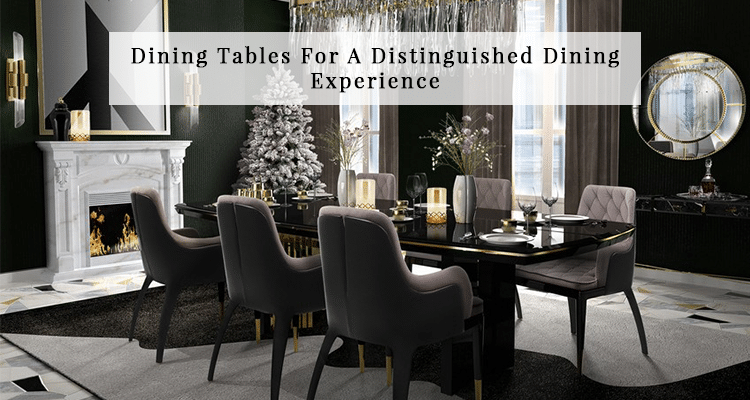 This article explains to you how to select exquisite dining tables that will give you and your guests a distinguished dining experience. You can certainly get a dining table of your choice in the best furniture shop in Kolkata. Dining tables come in a variety of shapes and sizes. They can be circular, rectangular or square-shaped. If your house is small, it’s best to go for a round table as it will save up a lot of space. See the shape of your dining room. If you want the dining table in the center, you can put a nice square one. A square dining table will have less space for seating. On the other hand, a round dining table will be able to seat more people as they don’t have corners. You can go for the classic look by buying a rectangular table that will serve your interests to optimal levels. After you have selected the shape, the next thing that you must consider is the size of the dining table. This is much easier to decide. Ideally, the size of your table should correspond to the size of your dining room. The Golden Rule here is that small tables go with small rooms and large tables go with large rooms. These little tips can go a long way in helping you select the right dining table for your room. The next thing that you need to select is the material of the table. Wood and glass are the two main types of materials that are commonly used. Glass tables look really elegant and go well with contemporary home décor. Wooden tables, on the other hand, look very practical and pragmatic. They go well with traditional furnishing styles. Round glass tables can really spruce up the ambiance of the house. They add an element of vivaciousness towards the room that is otherwise unparalleled. On the other hand, wooden tables can add an element of old world charm that can exude a penchant for native heritage. 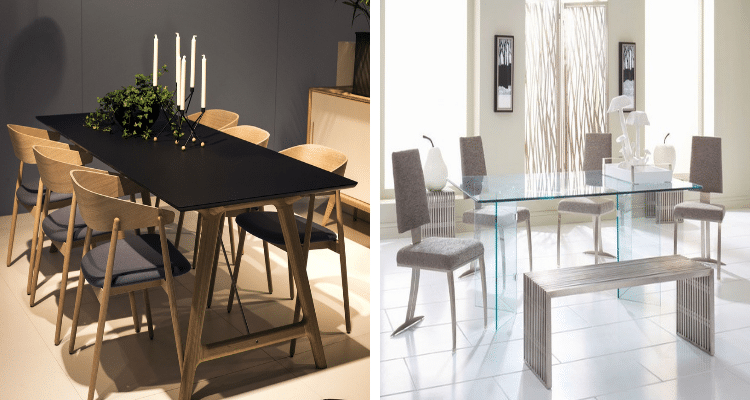 You can also go for modern dining tables made of acrylic or metal that will make you stand apart from the crowd. Just buy a one that has trendy designs that will help you give that artistic zing to your snazzy apartment. However, the newest trend on the block is using varied types of stones like marble as your table top. 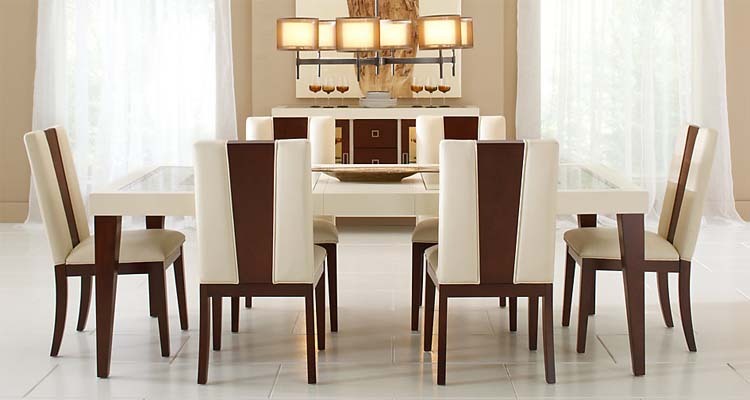 They look extremely classy and instantly uplift the look of your dining room. The next thing that you need to consider is the lighting of the dining hall. 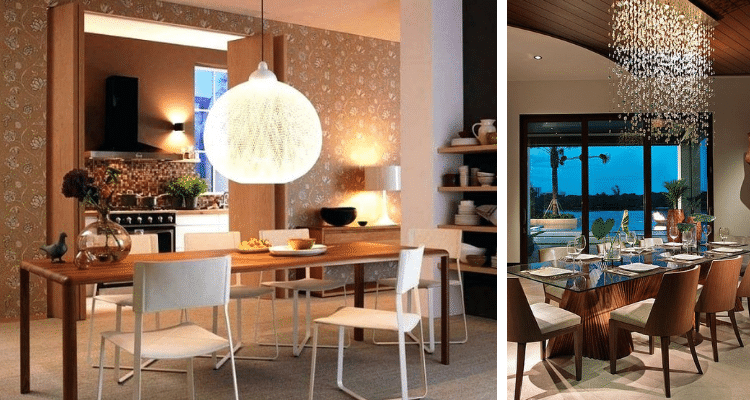 Here you have two options you can go for either chandeliers or lamps. Chandeliers add that element of finesse to your room that brings much pizzazz to even a bleak room. On the other hand, lamps help give you a heritage feeling that you can make the most of by using other classical furnishings to complement it. For chandeliers, two things must be kept in mind. The first one is that the size of the chandelier should correspond to the size of the room. The second one is that the style of the chandelier should match with the style of the table. You can go for chandeliers with round shapes which will complement a roundtable. This will make your room look really bright and will create an unbelievable environment that will leave your guests spellbound. For rectangular tables, go for elaborate chandeliers with intricate designs that will complement your elegant dining tables to optimal levels. You can choose between bulbs and candles in your chandelier for different occasions. For example, for normal occasions, you can go for bulbs that will help you win over your guests. You can use candles for romantic occasions like having a candlelit dinner with your loved one. This will enable you to use your chandeliers for different moods. If you wish to choose lamps, then you have a wide range of them to suit every room. You could go for covered lamps with different colors to provide an eclectic feel. This will really make your room look bright and colorful. You could even go for a lantern to accentuate the look. A Chinese lantern will help you add an Oriental touch to your dining hall. This will make your house really memorable in the minds of your guests. It will give them something that they will cherish for a lifetime. Try out these tips to elevate the level of décor in your dining hall. It will truly complement your outstanding dining table set. The final important thing that you should consider is the dining chairs. The golden rule to follow here is that your chairs should not be too large. If your chairs are too large, then it will spoil the appearance of your room. The other thing is the style of the chairs. These should complete the look; hence, make it blend with the overall persona and ambiance of the entire dining room. Buying smaller chairs is advantageous because they can fit into space under the table with relative ease. So just follow the tips mentioned above and give your guests a distinguished dining experience with exquisite dining tables!